A garden next to one of the buildings in Avonlea, the fictional village of Anne of Green Gables in Cavendish, PEI is enclosed by a white picket fence. Inside this village, tourists come to relive the world of Lucy Maud Montgomery, the author of Anne of Green Gables and enjoy family entertainment, puppet shows, stories and wagon rides. Avonlea - Village of Anne of Green Gables in Cavendish, Blue Heron Coastal Drive, Queens, Anne's Land, Prince Edward Island, Canada. 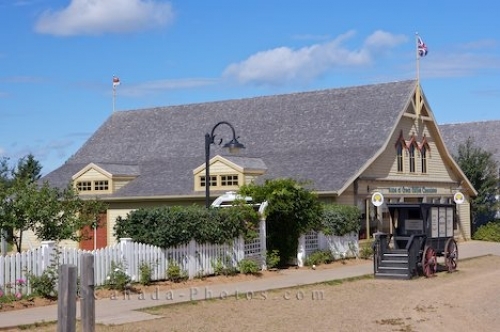 Picture of a building in Avonlea, the village of Anne of Green Gables located in Cavendish, PEI in Canada.